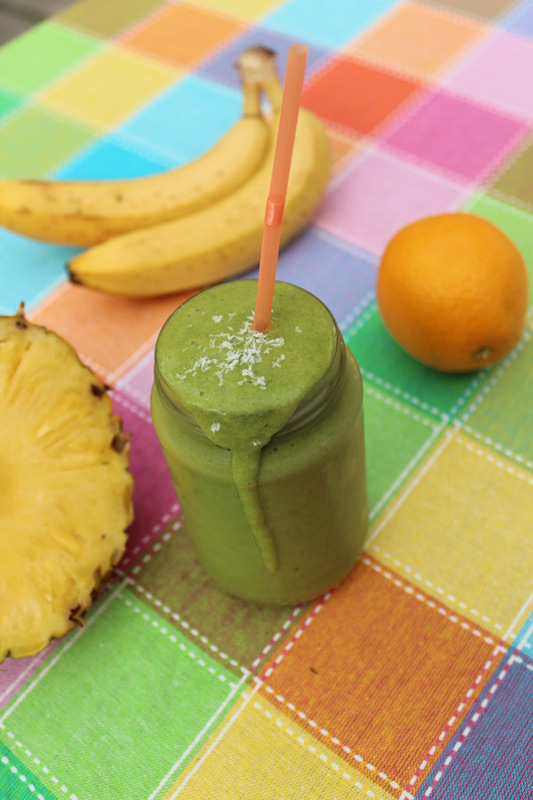 Banana Orange Pineapple Green Smoothie - Your process has a purpose. Vegan Month of Food 2014 Day #2. Today I present to you: the Banana Orange Pineapple Green Smoothie! Loaded with vitamin C from the orange and pineapple, and protein from the banana and spinach, this spinach is easy to digest yet satisfying. The other day, when one of my friends saw the list of ingredients of this smoothie, he was a little thrown off by the spinach. Spinach in a smoothie?! In case you’re not already acquainted, let me introduce you to my breakfast buddy The Green Smoothie. It’s basically a smoothie with any added leafy, green vegetable, such as spinach or kale. So why go green? I’m glad you asked. Fruit smoothies contain a lot of natural sugars. These sugars, called fructose, are good for you, but your system won’t be able to handle too much of it at once. When you eat fruit normally, you take bite-sized pieces and chew your food slowly (at least, you should!) before swallowing. Because smoothies are already pureed, it’s much quicker to drink it up, and therefore you tend to get in larger amounts of fruit in a less amount of time. Also, you normally wouldn’t be able to consume a couple pieces of fruit in a matter of minutes. Smoothies, however, do allow you to do this. This load of fructose creates a spike in your blood levels, resulting in an energy-burst. But like we all know, those energy spikes ultimately lead to a crash… Enter spinach. Spinach contains plant-based protein, which is easy for your body to absorb and digest. By adding this to a smoothie, your body will gradually absorb the fructose. This solves the problem of blood levels spiking and crashing. Super Spinach Hero has done it again! In this recipe we will use spinach, but you can easily substitute it for other greens (kale, for example). Also, if you don’t happen to have any greens in your fridge, you can add other forms of protein. Hemp powder and chia seed are some of my personal vegan favorites. One last word on smoothies… Take. small. sips. Never chug down your smoothie. It’s much better for you when you take it slow, and it’ll last longer that way, too. Yay! Put spinach, banana, pineapple, juice & pulp of 1 orange, and water in blender, respectively. * I always keep a bunch of bananas in the freezer. Peel the bananas, put them in a plastic freezer bag, and freeze. I’m not much into green smoothies, but this one sounds awesome. I will have to try it soon. I look forward to other recipes that you post during vegan mo-fo. I hope mine are as good as yours. Hi Tiffany! Thanks so much. I took a look at your site and got connected with October Unprocessed 2014. I’ll be participating in it this year. I think it’s a great idea!